A 2-year-old was pulled out of water about 7:30 p.m. Aug. 16 and was on the way to the hospital from this neighborhood. 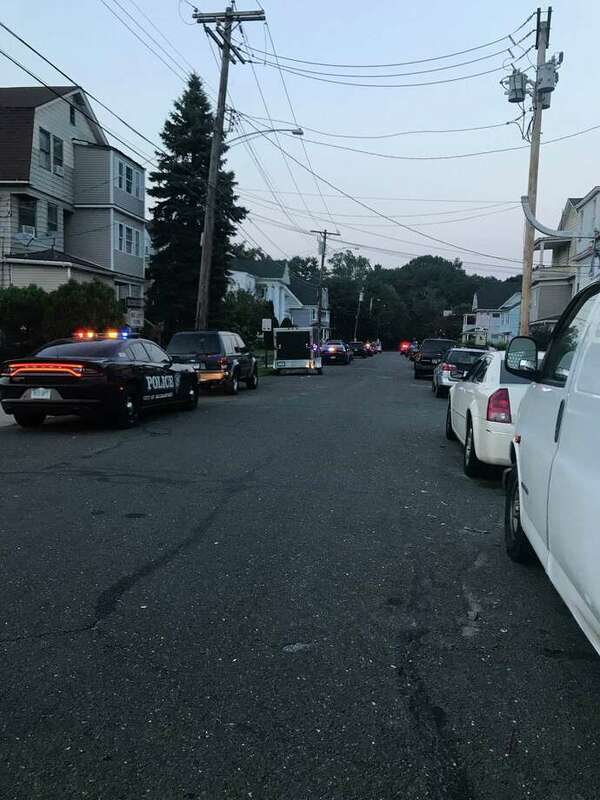 BRIDGEPORT — A 2-year-old pulled from a backyard pool Thursday evening has died, officials said. The child, who was taken out of the water around 7:25 p.m., was rushed to the hospital after police responded to a Charron Street residence for a drowning, police spokesman Av Harris said. First responders were at the scene moments after the 911 call was made and initiated CPR at the scene before the child was put into an ambulance that raced to a local hospital, escorted by police, around 7:30 p.m.
By 8:20 p.m., Harris confirmed the child’s death. “He’s dead, he’s dead,” a distraught family member or friend was heard wailing from the porch of the residence, surrounded by a group of people varying in ages. “I’m never going to see him again,” another yelled. As family and friends cried and let out screams from inside the residence and on the porch, neighbors looked on in horror from their houses and the sidewalk. One neighbor said the family moved into the house in early June from New York. The neighbor, who declined to give his name, said his 15-year-old son spends time at the house, adding that it’s a spot where youth who live on the street congregate. Another neighbor, who lives three houses down on Charron Street, said there is an above-ground backyard pool at the home. At least two additional ambulances were called to the home to help with family members and friends, clearly emotional, at the scene. Several police cars — marked and unmarked — were dispatched to the scene. The drowning remains under investigation, Harris said. He said no further information would be released Thursday. At 9:25 p.m., all Detective Bureau units cleared from Charron Street, according to dispatch reports. Earlier this year, a 5-year-old drowned in a backyard pool in Stratford. Town cops said the drowning, which happened on July 2, took place at a Sunnybank Avenue home. Officers gave the child CPR before an ambulance rushed the 5-year-old to a local hospital. The child died the next day. Last summer, a 2-year-old was pulled from a backyard pool by her mother at a May Street home in Bridgeport. She was rushed to the hospital on June 30 and was put on life support. She died on July 2.